Outdoor air conditioning units provide a vital function to your home, but their clunky and space-consuming characteristics make them unattractive features in your yard. Help the air conditioning unit blend in to the landscape with the use of decorative elements. Make sure your additions don't interfere with the unit's operation. Hide your clunky air conditioner with decorative elements. Cover your outdoor air conditioner unit with contact paper. Holes should be left for any areas that need ventillation. This technique allows you to be as subtle or bold as you want with the pattern. Use a color that matches your unit or solid green to coordinate with your lawn and garden. As an alternative, use a bold print with a colorful pattern or a zebra stripe so that guests won't know what the object is. Remove the contact paper as needed and replace it with a new pattern for a quick update. If you have a roofline or awning that extends past your air conditioning unit, fabric is an option you can use to cover the unit. Hang fabric along the wall where the air conditioning unit is located by attaching the fabric to the roofline over the area. White fabric has a breezy effect, you can use a bold pattern if you prefer. Make sure that your fabric is mold- and mildew-resistant to counteract the effects of rain and snow. Paint can help you to make your air condition blend in seamlessly with your home. Paint it in the same color as your exterior, or paint it green to match the lawn. You can also hand-paint a design by using a stencil. Use stamps to cover the air conditioning unit in a pattern that fades into the background, such as a camouflage pattern, next to your shrubs. Make a wood cover for your air conditioning unit. A basic wooden box can hide the unit, but you can add even more decorative touches. Add a metal screen to the front, or glue decorative tiles to the front or top of the cover. You can also add doors to the front for a decorative and functional purpose. Lattice is an inexpensive decorative feature that is suitable for the outdoors. Construct a three-sided screen to cover the front and sides of the unit. Add flowers or ivy between the slats. A careful placement of shrubs, flowers or trees can help hide your air conditioning unit. Place flowers in decorative pots, and add a tiered gardening shelf in front of the unit. Shrubs and trees can work similarly. Be sure that the roots don't grow under the unit to unbalance it, and don't plant the shrubs so close that the leaves get inside the unit. 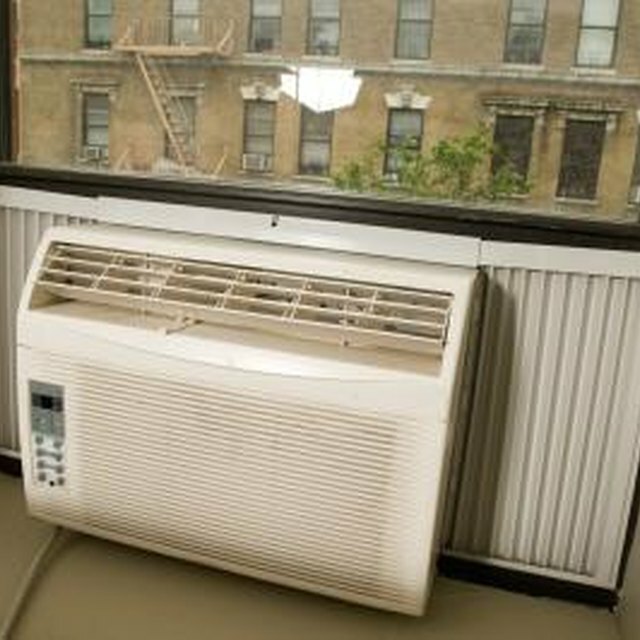 Apartment Therapy: Good Questions: Hiding a Window Air Conditioner? Is it Necessary to Cover Your Air Conditioner for the Winter?